Physics Days have long traditions gathering together physicists working in Finland. The days have been organised since 1948 when the first meeting was held in Helsinki. Back then Physics Days occurred less frequently but since 1972 they have been an annual event. The 52nd meeting of the Finnish Physical Society was organised on March 21-23, 2018, in Turku. On Wednesday morning participants started to gather to Logomo, a modern conference centre with industrial atmosphere, just a few hundred meters from the Turku railway station. The chair of the board of the Finnish Physical Society Rami Vainio opened the meeting. After Rami’s welcoming words Risto Ojajärvi from the University of Jyväskylä was awarded the Young Physicist Prize 2017, which is the Finnish Physical Society’s award for the best master’s thesis of the year. In his talk Risto focused on the key question of his thesis whether flat band materials can be room temperature superconductors. The opening plenary talk was given by Selma de Mink from the University of Amsterdam. She took us on an exciting journey through turbulent lives of massive stars. Selma de Mink at the Logomo Teatteri stage. She gave a really enticing opening plenary talk. As during the previous years, Physics Days 2018 continued with parallel and plenary sessions, poster sessions and exhibition. 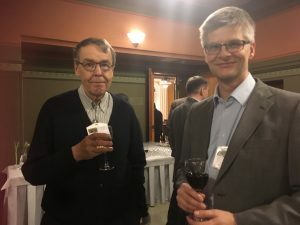 The other standard events during the days included the Annual Meeting of the Finnish Physical Society, division meetings and the Studia Generalia. And of course, the reception and conference dinner. The session included three ten-minute talks, which were given by master and PhD students at the University of Turku. The talks were related to the research these students have carried out and they covered topics like simulations in the product development, materials research for spintronics and medical physics. 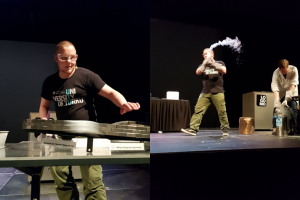 The session ended with an impressive and explosive science show given by the University of Turku Tiedepaukku-team. Minnamari mentions that the team gave a really good take-home message for the high school students “Behind all the fancy things and magic tricks you have seen on this that stage, there is science, explanations and a lot of hard work from physicist and other scientists”. Minnamari strongly recommends that a school student session should be taken as a standard event at Physics Days: ”We should always seize the opportunities to show young people what physics is really about and what physicists and other scientists really do. This way we can motivate kids and affect their attitudes towards science and get them interested in physics”. As suggestions for possible future improvements she mentions having speakers at different stages of their studies and research career and having a slightly longer session allowing to show more experimental and practical things. She also thinks that the event would obtain even more interest if advertised more widely. Physics Days carry traditionally a theme that aims at bridging across the fields. Examples of the past themes include “Dimensions of the Universe” (Turku, 2008), ”Physics on the crest of a wave” (Espoo, 2009), ” Sharing methods, exchanging ideas” (Helsinki, 2011), ”Light” (Joensuu, 2012), “Exploration and Discoveries“ (Helsinki, 2015), and “Physics in Society” (Aalto, 2017). This year the theme was “Seeing the Invisible”. The theme was highlighted both in Studia Generalia talk given by professor emeritus Mauri Valtonen from the University of Turku and in Conference Dinner speech by Laura Juvonen, executive director from Technology Industries of Finland. 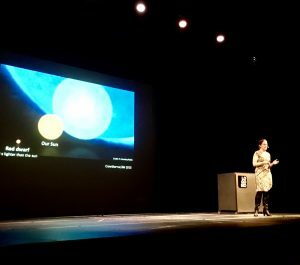 What could be a better example of seeing the invisible than the recent discovery of gravitational waves opening a new window on the studies of the Universe. Laura Juvonen emphasized in her dinner speech how important it is for scientists to advertise their research and communicate their results more actively to the wider public. Some of the presentations had also paid special attention to directly capture the theme, such as analysing works of art by scientific methods to be authenticated or to unveil additional information, using EISCAT 3D measurements to reveal basic properties of the ionosphere and highlighting often the hidden work of coding in astrophysics studies. It would be actually great to see the selected theme to be captured more widely in the abstracts. Something to think for the upcoming years. An important question is how to keep Physics Days as an efficient channel connecting physicists in Finland and how to increase the number of participants? Today everyone is busy and have their calendars full of meetings and other duties. International collaborations are emphasized but we should also keep national ties strong. At Physics Days you will meet physicists working in the same and neighbouring fields all over Finland and also learn what physicists in the other fields do. The social aspect is important part of the days. More established physicists meet the people they studied with but who then continued to different fields and places. Young physicists will get a chance to present their work for a larger audience and integrate within the community. Besides, at Physics Days you learn about the cutting-edge research internationally. Each year there are many participants from abroad and in particular many plenary talks are given by renowned international speakers. New things are actively tried. Participating to a conference in Finland can be surprisingly pricy and for these reasons the participation fee has been kept modest. This year the fee for undergraduates was lowered and the fraction of young researchers increased considerably. In 2017 when Physics Days were organised in Helsinki by the Aalto University each parallel session had also a few invited international speakers. The scientific organising committee aimed at finding the speakers that covered as broadly as possible the interest of the participants. It is, however, not an easy task to find the right balance with the educated audience having diverse expertise, in particular in parallel sessions where most talks are shorter.